Dawson City is located at the point where the Klondike River flows into the Yukon River. The site was once used as a salmon-drying camp for Indigenous people who fished along the Klondike. The town is named after George M. Dawson who was a director of the Geological Survey of Canada and led an expedition into the area in the 1880s. During the height of the Klondike Gold Rush, Dawson City had a population of roughly 16,000 and was the commercial centre for a total mining population of 30,000 people. It had opera houses, fine hotels, stores, breweries, churches, and of course, lots of saloons and banks. The North-West Mounted Police maintained law and order and enforced Sunday closings. 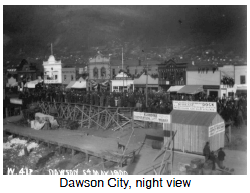 In 1898, Dawson City was the largest Canadian city west of Winnipeg. When the gold rush petered out, Dawson City declined in size and importance. In 1953 Whitehorse, 530 km south of Dawson, became the new capital of Yukon. Dawson City has been revived as a tourist centre and today festivals are held each summer to commemorate and re-create the heyday of the gold rush.